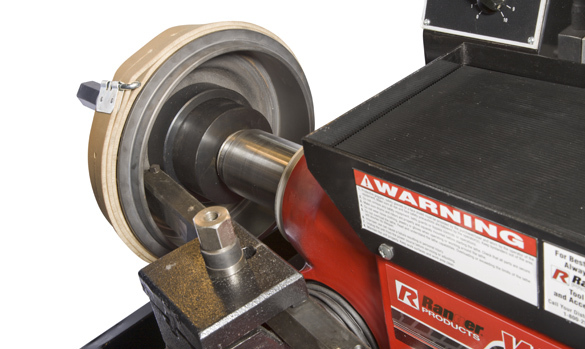 The ruggedly built RL-8500 brake lathe is capable of faster, more accurate and easier rotor and flywheel and drum and flywheel resurfacing than any other brake lathe in its class. 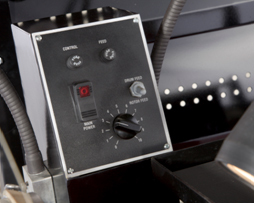 Infinitely adjustable feed rates allow you to easily modify cut speeds with the simple turn of a dial. Now you can reduce or increase the cut-time for best finish results, whether you're speeding through an initial rough cut or a single-pass micro-finish. 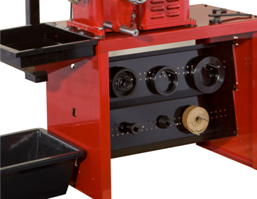 This complete lathe package includes lathe, a sturdy bench and large tool storage backboards so you can hang all your adapters within close reach. Ranger brake lathes replaced antiquated transmission / gears found on other brands. You would be surprised if you stood back and watched a brake lathe machine a finish cut on a rotor or drum or flywheel. Brake rotors are very smooth or should be. If you were to turn a rotor on any lathe then drop a hammer on the floor next to the lathe, you would see a noticeable degradation of the cut at the moment of impact. Vibration causes frequencies which get transferred to the finish cut. Because the Ranger RL-8500 brake lathe does not use gears and transmissions, we completely eliminate multiple frequencies that could degrade the machining finish. The formation of surface roughness is usually the result of the tool feed rate, spindle rotational speed, tool geometry, the material properties and relative tool-work vibration. 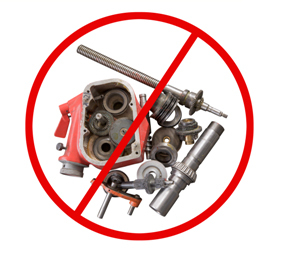 Vibrations and chatter from gears, bearings and mechanical drive parts are eliminated--the same kind of vibration that is often transferred to the tool-tip leaving irregular cuts on the machined finish. How stable is a Ranger brake lathe? Superior quality, durability and precision, that’s what makes Ranger the growing choice of professionals worldwide. 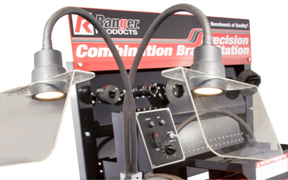 Whatever your brake service needs may be, you can rely on Ranger to deliver the right equipment for the job. As a preferred supplier of quality automotive service equipment, our goal is simple: give our customers the best quality and value while providing unparalleled service and support. Why does Ranger offer you so much more? Because we don’t just believe in developing superior products, we believe in creating solutions that make your job easier. 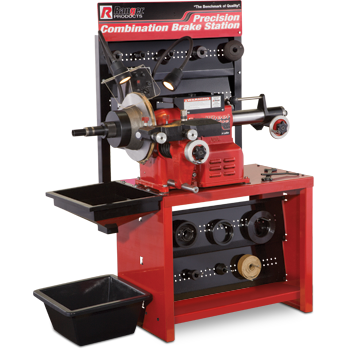 Since its introduction nearly four decades ago, the design of our RL-8500 combination brake lathe has been a favorite of brake technicians everywhere. It's simple, it's fast, it's very precise and it runs forever. 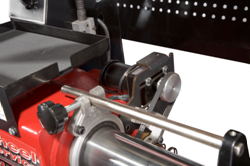 It features our twin-cutter tool head with micrometer dials and quick drum-to-rotor changeover. The adjustable speed settings allow you to quickly rough cut rotors or slowly give them a fine, smooth cut. An infinitely adjustable spindle-feed gear box provides variable speed settings, providing finish cuts that meet or exceed factory specs. 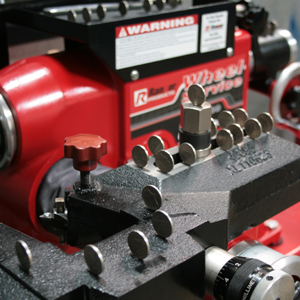 Our negative rake tooling yields one pass finish cuts every time and the standard 1" arbor provides you a multitude of tooling and adapter choices from either Ranger or other aftermarket suppliers. While others charge extra, we include this sturdy steel bench with large tool storage backboards so you can hang all your adapters with an arm’s reach. A durable multi-compartment toolbox provides storage for all adapters and accessories. Large chip "catch" funnel and chip bin keeps work area clean and safe. A convenient quick-change tool-head design allows operators to quickly change the setup from drums to rotors and vice-versa. Up-front controls are designed for minimal operator movement. 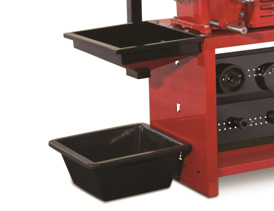 A handy tool tray is located near the front of the machine, so you can keep your favorite brake lathe tools nearby. 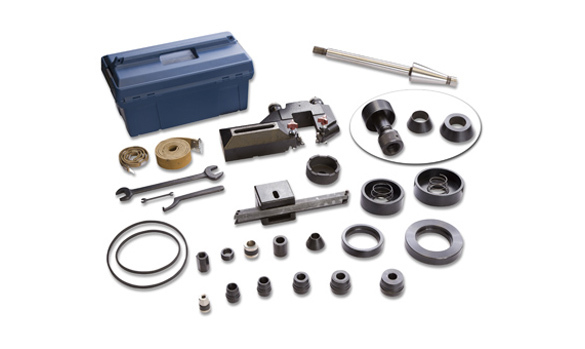 Includes micro-dial twin tool cutter, boring bar, inside floating adapters, self-aligning spacer, outside floating adapter, centering cones, spacers, double-taper adapters, hubless adapters, carbide cutting tools, 6-sided carbide cutting inserts, 1" arbor, arbor nut, backload spring, spare bulb for lamp, illustrated instruction manual, wrenches, high-impact anti-vibration bands and plastic storage case. Dual LED extra bright work lamps keep both sides of the rotor and your work area properly lighted, even in the darkest corners. Large chip "catch" funnel and bin keeps work area clean and safe. 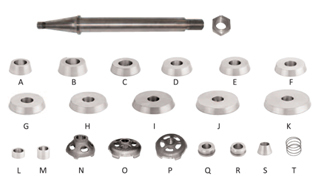 Our super-duty adapter package consists of an upgraded 1-7/8" arbor and a wide variety of adapters. This enormous multi-piece set allows you to expand the coverage to handle virtually any vehicle, all the way through 1-ton trucks! Quick-Change Adapter-Plus system with built-in springs eliminates the need for conventional bell clamps and cones.